One the fourth day of Christmas my true love gave to me: four VOLTEKKA!, three PRIMAL SCREAMS OF HOT BLOODED FURY!, two(million) RONs!, and one GIGA DRILL BREAKER! This is the fourth post in a series as I look at the twelve best anime moments of the year from shows I watched. Key there being watched, as a few of these moments are going to be from some pretty old stuff, but I think they’re damn good enough to talk about at any time. This is a joint ABC blogging project with other contributions from Roxas, CCYoshi, Orion, Owen S, Xerox, Nekoron, Martin, Michael Huang, usagijen, and Moogy. Yeah, there’s a lot of us. 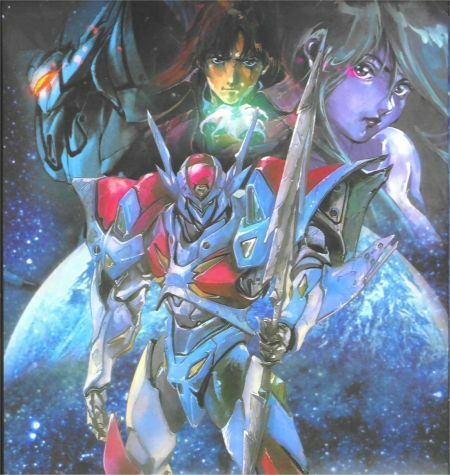 If you haven’t seen Tekkaman Blade then go watch it now, as this post contains some massive spoilers. I haven’t really mentioned Tekkaman Blade much this year, though admittedly it’s hard to talk about a mecha show back from 1992. However, TB is a very good show with a solid plot and a lot of raw emotion. This particular moment comes from episode 25, a mini climax of the kind often found in fifty episode series. First a bit of background: Tekkaman Evil aka. D-Boy’s brother, along with his new evil tekkamen companions Sword, Lance, and Axe, is attacking the Space Knight base with renewed vigor. Blade aka. D-Boy is unable to immediately protect the base, as he must go stop a space military plan that will end up killing millions of innocent civilians. Just days before the attack D-Boy was reunited with his lost sister Miyuki, only to discover that she is already dying from an incomplete tekkaman transformation. As the evil tekkamen’s attack becomes increasingly more ferocious and with Blade nowhere in sight, Miyuki decides to head out and fight to protect her new friends. She transforms into Rapier but is far too weak to put up a good fight and is soundly beaten. Blade returns just in time to see his sister crucified, literally, and stabbed repeatedly by the evil tekkamen to draw Blade out. Blade flies into an insane rage and is about to fight when Miyuki takes things into her own hands and chooses to self-destruct, hopefully taking the evil tekkamen with her in a massive explosion. Sadly the selfless act is to no avail, as all of the evil tekkamen are still alive and the Space Knight base has been completely destroyed. The strong series of emotionally heavy and plot oriented episodes that lead up this moment are really what makes it so great. You see D-Boy reunite with his sister, reveal the truth of his past, and come to terms with the full effect of the Rahdam on his family. Miyuki’s sacrifice is a devastating blow that takes him several episodes to recover from, but he ultimately comes back with a renewed sense of purpose in his fight. The moment itself also features the best animation of TB since the series began, some great voice acting, and an ED song insert that changes the normally mediocre “Energy of Love” into a very emotional elegy. A standout moment for a great, and often neglected, show. I really need to buy the third boxset soon.